Simply stated, providence is God’s intervention in His creation. The theological concept of providence incorporates the foreseeing care and guidance of God. In fact, the Latin root of the English word has the sense of knowledge of the future. So, because God knows the future, He controls the present. Providence is probably the main point in which a biblical worldview comes into conflict with contemporary worldviews. Certainly, the Old Testament worldview was more respective of God’s providence than is the modern, scientific view that asks “Why” and “How” about every occurrence in life and nature. The Old Testament writers seem to have a rich understanding of God’s providence. To the Old Testament writer, it’s all providential! The two major events from the life of Jacob described in Genesis 30 illustrate the Old Testament perspective of providence. Rachel was childless while her older sister, Leah, had borne several children to their husband, Jacob. Jacob preferred Rachel over Leah and probably gave Rachel more of his attention and Leah stopped bearing children. Leah’s son, Reuben, found some mandrake plants while out in the fields and brought them to Leah. The mandrake is a root thought to increase fertility in women. Rachel asked Leah for the mandrakes because she thought they would help her get pregnant and traded Jacob to Leah for a night to get the mandrakes. While we don’t know if the effect of the mandrakes was something biological or functioned more as a placebo, they seemed to work in the case of both Leah and Rachel. According to the story both sisters became pregnant under God’s guidance: “ God listened to Leah, and she became pregnant and bore Jacob a fifth son...Then God remembered Rachel; he listened to her and enabled her to conceive. She became pregnant and gave birth to a son and said, ‘God has taken away my disgrace.’ She named him Joseph…” (Genesis 30:17-24, NIV). After fourteen years of service to his father-in-law, Jacob wanted to return to his homeland. Jacob proposed that as wages for his service he would take the rare black and multi-colored goats and speckled and spotted sheep and his father-in-law, Laban, could keep the more common and valuable white sheep. 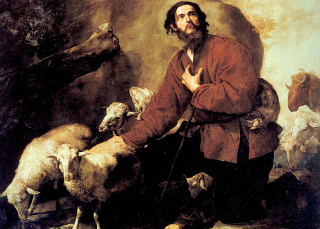 Laban agreed to Jacob’s proposal, but to prevent Jacob from accruing more livestock, Laban immediately removed all the non-white sheep and goats from his flock. Jacob attempted to counter Laban’s deceitful plan by increasing the likelihood of spotted or speckled offspring among the mating sheep. Jacob took fresh cut branches from trees and peeled back the bark to expose the white inner wood of the branches (vs. 30:37). There is a play on words in this verse. Laban’s name means white and Jacob played the “white” game. By peeling back the tree branches to the white inner part Jacob outsmarted Whitey. In accordance with the superstition of that time, whenever the stronger females were in heat, Jacob would place the white branches in the watering troughs near where the animals mated. But, if the animals were weak, he would not place the white branches in the troughs. Using these selective breeding practices, the weak, white animals went to Laban and the strong, spotted and streaked ones went to Jacob (30:41-42). While Jacob used selective breeding practices to gain stronger animals and increase his flock, he later acknowledged that God had prospered him by revealing to him in a dream that only the streaked and spotted sheep and goats were mating. “In breeding season I once had a dream in which I looked up and saw that the male goats mating with the flock were streaked, speckled or spotted. The angel of God said to me in the dream, ‘Jacob.’ I answered, ‘Here I am.’ And he said, ‘Look up and see that all the male goats mating with the flock are streaked, speckled or spotted, for I have seen all that Laban has been doing to you. I am the God of Bethel, where you anointed a pillar and where you made a vow to me. Now leave this land at once and go back to your native land'” (Genesis 31:10-13, NIV). Even though Laban tried to cheat Jacob, God protected Jacob. So what was once true of Laban’s flock, now becomes true of Jacob’s flock. A greater and greater proportion of Jacob’s flock were strong animals, and an increasing proportion of Laban’s flock became weak animals. Jacob’s white branches function much like Rachel’s mandrakes. It was not the mandrakes that made her fertile and it was not the white branches that produced recessive colored animals. Genesis 30 declares that the Lord opened Rachel’s womb and that it was God that brought the increase to Jacob’s flocks. So, whatever agencies God may allow to be used–mandrakes, tree bark, superstition, science–the force at work is God’s sovereign will. God’s providence utilizes the natural occurrences of our lives in conjunction with our supernatural experience of His presence in our lives to transact His sovereign will. This entry was posted in Abrahamic covenant, God's will, providence and tagged Abrahamic covenant, Bible, providence. Bookmark the permalink.